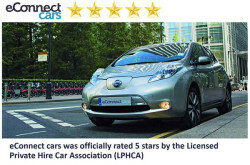 – a London chauffeur-driven car service using all electric vehicles. Brand new, top of the range Nissan Leaf Teknas. These cars are 100% electric, full leather trim, heated front and rear seats and provide an excellent driving experience. 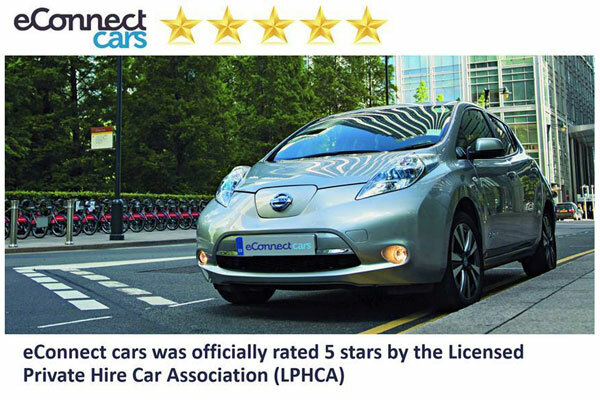 eConnectcars received a 5 star grading by the Licensed Private Hire Car Association (LPHCA). How much does it cost to book a taxi ? email bookings@econnectcars.com or call at 0203 002 5544 for price. And you can book online here.